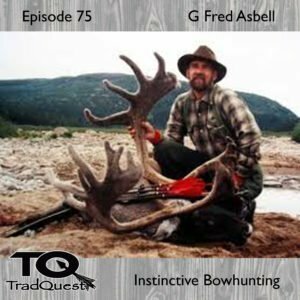 Fred Asbell the man who wrote the books on instinctive shooting and stalking and still hunting. Fred was a pleasure to talk to and a legend who is as humble as can be. We talk shooting, hunting and some history of traditional bowhunting. It’s a little disappointing listening to Fred explain how to shoot instinctively because he doesn’t go into hardly any detail about what it actually entails, other than to ‘concentrate’ and shoot alot. For one thing, depth perception is a critical element with regard to shooting at distance, and so is alignment. I imagine that the lack of useful instruction available to new shooters who want to understand the process is what discourages them from pursuing it further, instead opting for the very heavily marketed and discussed method referred to as gap shooting (which includes a number of tweaks such as string walking, fixed crawl, etc.) or Olympic archery. The goal in archery instruction is now related almost entirely towards precision target shooting or distance field shooting, not close-range hunting under unpredictable scenarios or fluid shooting using our natural intuitions as a learning curve. It is unfortunate…on several levels…but mostly because the idea of traditional archery using a point-with-rhythm vs. an aim-with-dogged-determination mentality is becoming a thing of the past, along with respect for that discipline. We have become a product of modern invention and convenience, in effect practicing regressive progressiveness driven by market science and (dare I say it) an apathetic attitude towards the basic aspects of shooting a bow that make it such an entertaining challenge. Traditional archery (including instinctive shooting) is becoming archery’s dinosaur, an ironic and sad metaphorical ending especially given the enduring reference to a ‘stick and string’ even as it is now represented by clickers, plungers, string blurs, arrow tip sights, Olympic glory and disparaging views of yesterday’s much simpler shooting objectives and techniques. So long, thanks for a quick look back at what once was a vital component of traditional archery.